Cardi B teased her partnership with Pepsi a while back, and it was published on Jan 28 ahead of the 2019 Superbowl. As of this writing, on Twitter alone, it’s reached over 7M views. What’s fascinating about this ad is that it is not a Cardi B ad. Cardi might be the main attraction, and it was the reason I wanted to see it, but she is not the star. The star is Steve Carrell. The ad opens at a restaurant where the diner requests a coke and the waiter asks, “Is Pepsi, ok?”, an innocent question we’ve all been asked countless times at many a restaurant. It feels trivial, but that question becomes the focal point of the entire ad. Steve Carell pops up from the neighboring booth (presumably dining at the restaurant himself) and berates the server about the question in his charming, Steve Carell way. “Is Pepsi ok? !” he demands. “Are puppies ok? Is a shooting star ok?!”. Here we encounter the first moment of brilliance in this ad. Pepsi took the very innocent, innocuous question, “Is Pepsi ok?” and forces us to examine what it implies. It elevates the question, bringing it to the forefront of our minds and then demands that we reject it. What a ridiculous question! It’s so ridiculous, in fact, that Steve-freaking-Carell had to jump out of a booth to correct the poor server. I’ve never thought twice about the question, and my guess is that you haven’t either. But after watching this ad, I bet you’ll think differently about it the next time it’s inevitably asked at a restaurant. The second moment of brilliance is in the use of Carell himself. Pepsi attaches its brand, and that question, “Is Pepsi ok”, to one of America’s favorite entertainers. Anyone who likes Steve Carell (which should be everyone), will love his character in this ad, but his acting feels even more targeted. Carell’s indignation is very reminiscent of his beloved character, Michael Scott from The Office, making this, not just another great Carell moment, but a throwback for fawning fans of The Office. We miss that show, and any nugget that brings us back to Scranton is a delight, and much appreciated. But the throwbacks don’t stop there. Carell goes, “Pepsi’s more than ok, it’s — ” and the camera pans to Lil Jon. He leans over the counter and finishes Carell’s sentence with his signature, “OKAY”. This is the third moment of brilliance. The incorporation of Lil Jon and Usher’s hit song, “Yeah”, released in 2004, is a throwback for millennials. In two syllables, with the beat blasting and Lil Jon’s grill glistening, we’re brought back to club nights in the 2000s. Or whatever your social scene was back then. But the beauty of this moment is that it is a moment in the ad. Lil Jon is not forced to read a script, act, or pretend to drink a Pepsi. He is there to do what he does best, and as soon as his “YEAH” is over, he kicks it off to the main attraction, Cardi B.
Cardi B bursts through the front doors of the restaurant, symbolic of her ascent to fame and her booming personality. She follows Lil Jon’s “OKAY” with her own take on the word, her signature “Okurrrrr” followed by her signature tongue-out cackle. Pepsi could’ve stopped here. And if they did, they still would’ve won. But the brilliance is that they leverage all of Cardi B to her full brand potential, all the way down to her fingernails. If you follow her on Instagram, you know all about her nails. They are long, sharp, and boldly bedazzled, and this detail was not overlooked by the Pepsi team. She grabs a can, nails sparkling red, white, and blue. She struts over to Carell in slow motion and takes a seat. Near the end of the ad, her nails get another moment in the spotlight as you hear the pronounced “clink, clink” of Cardi tapping her nails against the can. Cardi loves anything that sparkles, and her outfit embodies all of that. Her shoulder-padded dress is entirely covered in red, white, and blue sequins. Even the Pepsi can she holding is bedazzled! She shines and sparkles from head to toe, literally, as her hit song, “I Like It Like That” booms in the background. She is the main attraction, but she is not the star. Her appearance is there to serve two purposes 1) to get you to click on the ad and 2) to get you to stay. But the only line she has is “Okurrrrr.” Her moment is, again, a moment. She is not there to act or even actually drink a Pepsi. She’s there to give you everything you love about Cardi B, and that is all. This is particularly evident by the fact that once she slides into the booth across from that first diner (the one who innocently requested a Coke and somehow ended up in a soda music video), Cardi B’s part is basically over. A nice touch to end that moment was the camera cutting back to Carell who motions the “Ok” hand sign at Cardi B as she walks over. I see you Pepsi! The ad ends with Carell asking the server, “What have we learned today?” The server hesitantly responds, “You want a Pepsi?”, and everyone agrees that is the correct way to handle this interaction. We end at the beginning, with Carell as the star. After settling the “Is Pepsi ok?” debacle, he tries to come up with his own “Ok” catchphrase. In his charming Michael Scott character, it is funny, awkward, and the perfect ending to this ad. 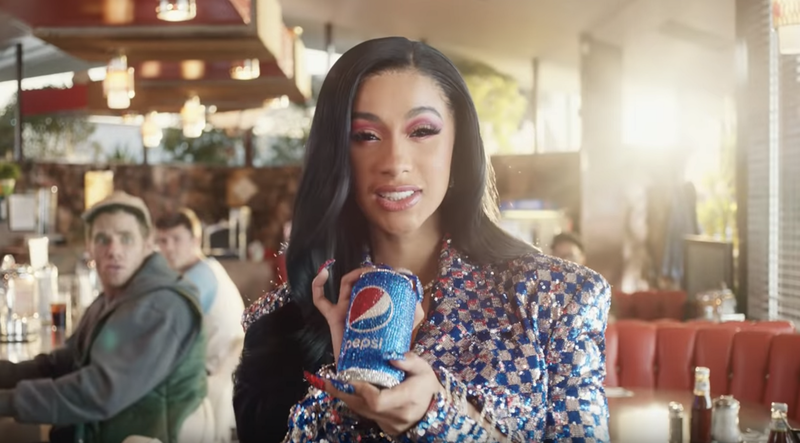 In fifty three seconds, Pepsi managed to speak to all of America, from the family-friendly star, to the millenial throwback, to the current heat that is Cardi B. It was steeped in humor and a warm familiarty. And in all that star power, its message was never lost: A Pepsi is more than ok.